← A Chewy Chocolate Cookie made with Chocolate Spread…. 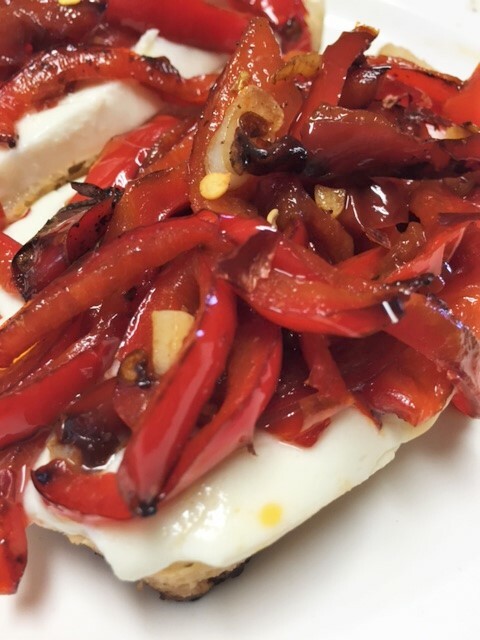 Roasted Pepper and Mozzarella Bruschetta………. The possibilities are endless when it comes to bruschetta. It’s a wonderful snack and great for serving to guests. My favorite is the basic marinated tomato and garlic mixture on top of a crunchy little toasted crostini slice. But I make so many kinds. 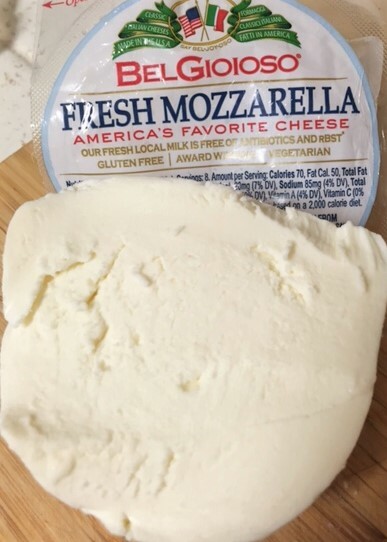 Another favorite of mine is roasted red bell peppers and garlic, on top of fresh mozzarella cheese, on top of buttery, toasted bread. I used homemade bread today and it was so delicious. 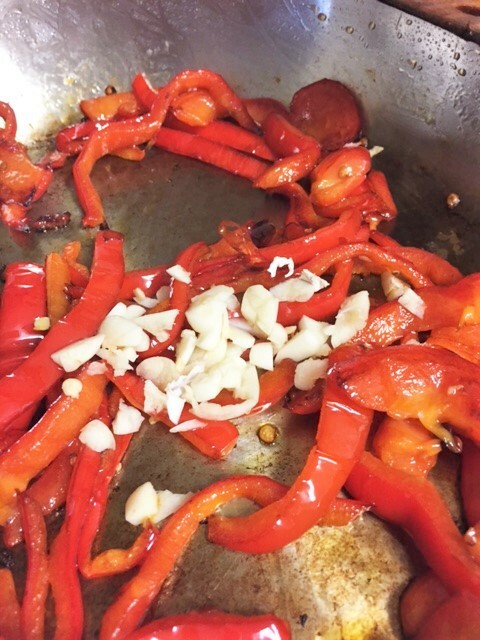 The red peppers are cooked slowly until they are caramelized and soft. 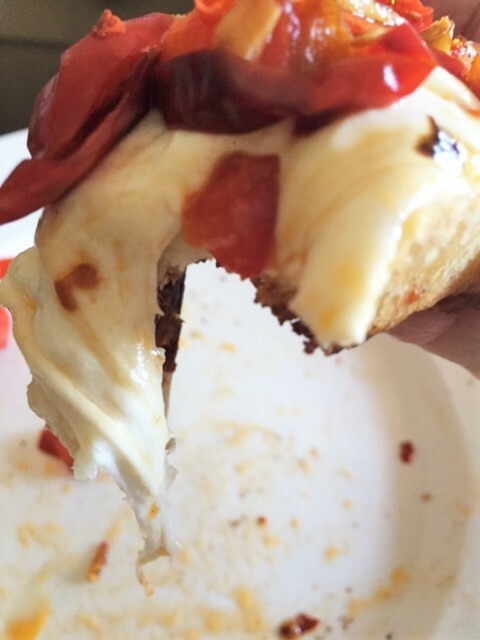 When you put those peppers on top of the cheese, the cheese starts to get soft and melty. You hungry yet? Then you take that first bite……the crunch of the buttery, toasty bread…..the chewy, melty strings of cheese….and those slightly charred, sweet peppers and that bite of garlic. Holy crap! Doesn’t that sound good? If you want a little tang, drizzle a bit of good balsamic vinegar on top. I sprinkle a bit of crushed chili peppers on mine, since I love some spicy heat. Oh, and I recommend a good hearty bread, sliced thin. Maybe a ciabatta or sourdough bread. Oh, and a nice glass of wine…like Pinot Grigio, or a crisp Chardonnay, or whatever your favorite is. In a skillet, over medium heat, pour a couple of tablespoons of olive or vegetable oil. Dump in the sliced bell peppers. Slowly add 1/4 cup of water. 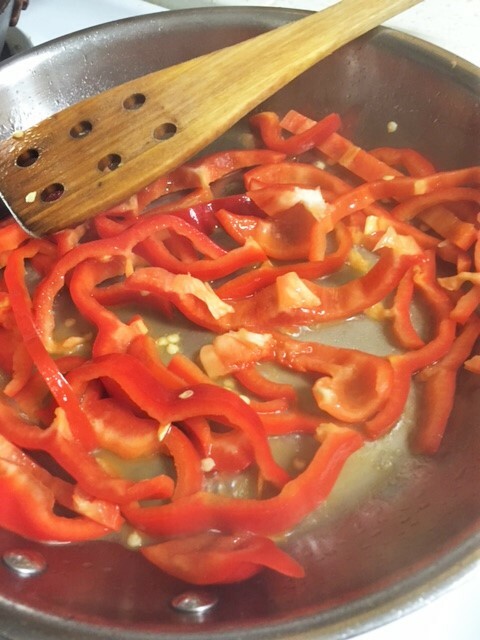 (It will sizzle) Stir the peppers around and allow the water to evaporate. Continue tossing the peppers in the pan, until they are soft and getting a bit charred. Add the minced garlic and keep tossing so your garlic won’t burn. When the peppers are nice and soft, remove from heat. In another skillet, melt some butter, or you can use olive oil. Place bread slices in the butter or oil, top with cheese slices. Top cheese with peppers. 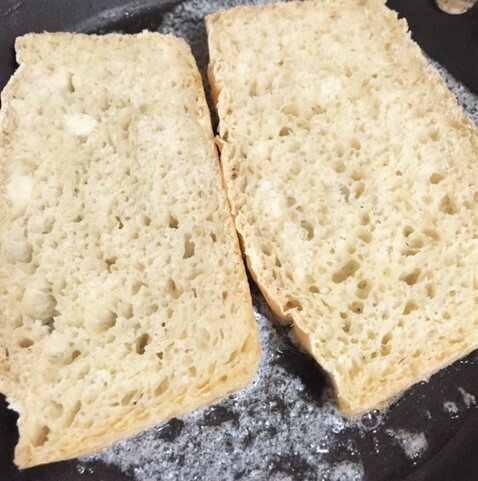 Once bread is browned and crispy, remove from heat and onto serving plates. Drizzle with balsamic vinegar and serve. If you are making these for a crowd, brush butter or olive oil over all your slices of bread and place on a large baking sheet. Place them in the oven at 425 deg. until browned and crunchy. Remove pan from oven, top bread slices with slices of the cheese and top with peppers. The heat from the peppers will slightly melt the cheese.